About a week ago, I wrote about miracles. A friend shared that my claims of miracles and answered prayers caused her pain. "What about those people who have lost their children despite the same prayers?" On Sunday, September 27, 2015 we became one of those families when Yarely died. She had been improving and her doctors were encouraging. We were in shock. We have the same emotions and questions that any family has at the death of a child. Why? He opened so many doors, how could He close them now? The Hondurans move quickly. That afternoon the all-night “velorio” (wake) began. Dulce and the other cooks fed us arroz con pollo at 10, cookies and coffee at midnight, homemade chicken soup at 2AM. The next day was the funeral. It is all over so fast while your head is still spinning from the news of her death. Yet, heartbroken, mourning for what might have been, we have a spark of hope within. We ask, “Lord, where are you?” He gently answers, “do not fear, for I am with you; do not be dismayed, for I am your God. I will strengthen you and help you; I will uphold you with my righteous right hand.” We open our hearts and look for miracles and celebrate answered prayers. A couple of years ago, I asked a Honduran pastor how the very poor, who suffer so much could have such profound faith. “We set our sights on the next life.” I think this is also the answer to Yarely’s death. We miss her and hurt deeply while we rejoice and praise God. We have unanswered questions while we trust in the Lord’s call to Yarely to come home. We ask a million “what ifs” while we expectantly wait to see how He will redeem this tragedy because, of course, He has and He will many times over. As Margaret Merritt, dear friend and LAMB Director of Operations, said, “It depends on whether you see Yarely’s death as the end of the story, or if you believe the story continues.” Do you set your sights on this life or do you raise them 90 degrees straight up to heaven? We believe that Yarely had shifted her sights upwards before her illness. 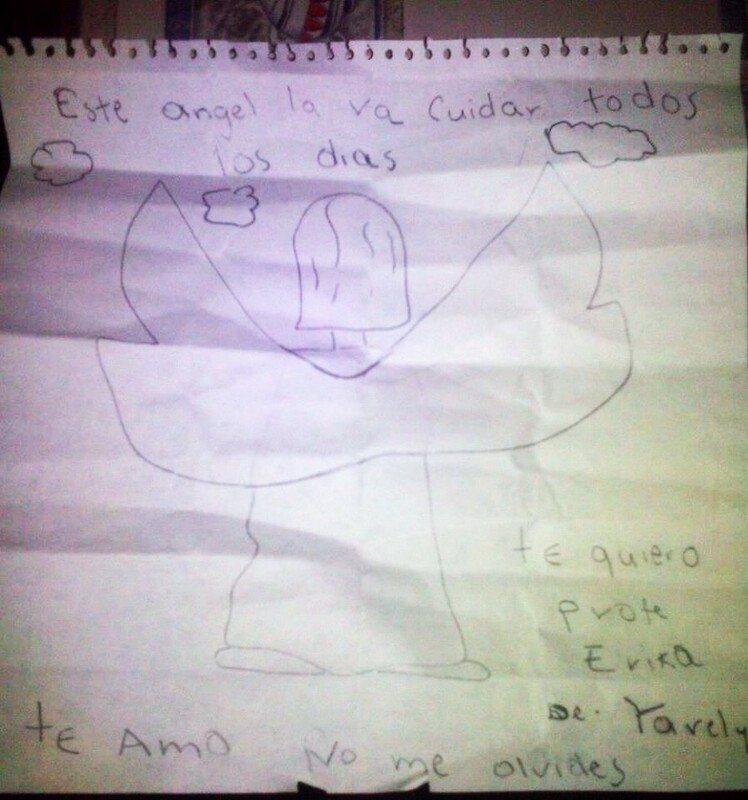 Her teacher shared a drawing Yarely had given her. At the top it says: "This angel will watch over you always. I love you Profe Erika. 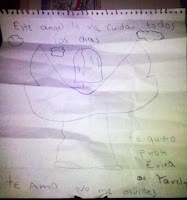 From: Yarely.” Along the bottom it reads, "I love you. Don't forget me." It is a sweet but strange sentiment from a 10 year old. Unless it was prophetic… The night before Yarely died, her mother, Misti and I went to the evening visit as usual. Yarely would always open her little hands and grasp ours. Misti would massage a rich lotion on her legs and massage her temples. Yarely would almost purr, she loved it so much. But Saturday night, she didn’t want to be touched. She would sleep off and on. When she awoke she would look at us and grimace, crying without sound or tears. We were baffled by this sudden change. She had had a crisis 3 days earlier when she went into cardiac arrest for 3 minutes before being revived. Misti and I wonder if during those 3 minutes she caught a glimpse of heaven because, on Saturday, every time we touched her it seemed like we were bringing her back to earth. She was ready to go home. How can we not rejoice for her? But the Lord isn’t only concerned with Yarely. He has made His presence so tangibly felt…in small ways and large sweeping ways. The rainbow that we saw over the Children’s Home the morning of her funeral and that Margaret saw on her way to church that same day was a gift, a reminder of God’s promise and a path for Yarely to skip up to heaven. When we raise our hearts to heaven, we can see these grace notes. Yesterday I learned that Arely’s 6 year old son, Isaias, had a miraculous experience. The top half of Yarely’s casket opened and had a plexiglass window so you could see her. Isaias told his mother, “She touched my hand and she was looking at me and laughing with me.” How like Jesus to send an encouraging message about our precious child through another precious child. Yes, we are one of those families who did not receive the miracle we prayed so fervently for – full healing and a long life with her parents, Misti and Brad. We were praying for miracles here on earth. Instead, Yarely received the greatest miracle of all – perfect health, enfolded in the loving arms of the Risen Lord. We believe Yarely’s story has just begun, relocated to heaven. He didn’t shut the door, He opened a new one. God will redeem this - a tragedy for us, a triumph for Yarely. I can’t wait. I pray we will all shift our sights 90 degrees upwards.